It’s official! The Summer holiday is booked! Round about now is the time when I start to longingly stare at clothes through shop windows, and fill my virtual shopping baskets full of clothes before realising I can’t afford to buy them. 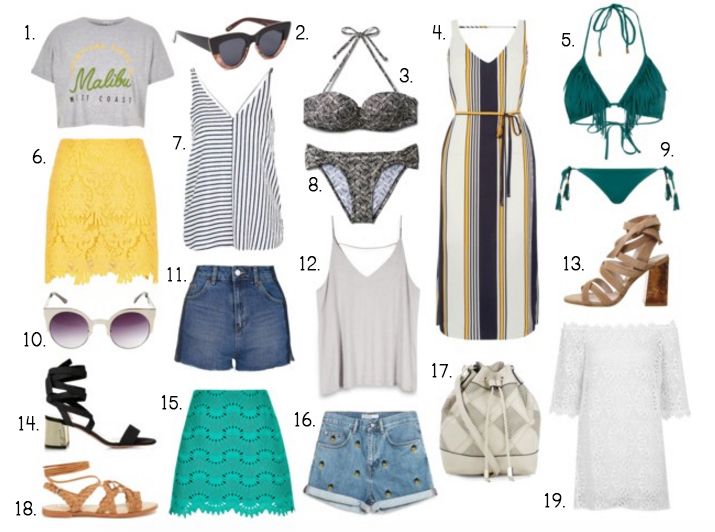 I thought I’d torture myself a little more and put together a wish list of all the things I’d love to pack up in my suitcase, and hopefully over the next few months I can treat myself to a few pieces before we jet off for two weeks of sun, sea and sand! My holiday wardrobe tends to be pretty casual, but I like to throw in a few smarter, more special pieces in to dress up my look for evenings, such as a pretty skirt, or a pair of statement heels. For day time i’m lusting after beautiful bikinis in block colours and pretty prints, with crochet beach dresses to throw over the top and a pair of statement sunnies when we’re lazing by the pool. For days out and about exploring I love a simple denim short and jersey top combo. High waisted shorts are my favourite, whether ripped or rolled up, and a simple oversized cami top tucked in does the job, paired with simple flat sandals. For evenings out for dinner and drinks (all hail all inclusive) I’m hoping to fill my case with midi dresses, bold and bright lace skirts and printed tops, paired with tie up chunky heels. If only these would all magically make their way in to my wardrobe! Are you heading off on holiday this year? What’s on your Summer holiday wish list? Roll on July! "THE QUEST FOR A HEALTHIER LIFESTYLE"
Some great picks! I'm not going on holiday this year (although I'm thinking about booking something last minute), but I still want to invest in some summer clothes! I love the yellow skirt and white sunglasses. Ooo some really lovely picks! Definitely perfect holiday picks! I love number 4.
waooo lovely summer holiday wishlist. I like Kurtis for summer holiday.